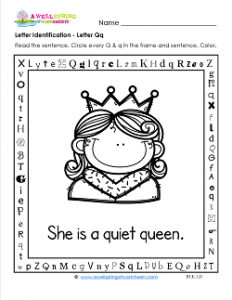 Even though this queen in this letter identification worksheet looks pretty outgoing and friendly, the sentence, “She is a quiet queen.” has got to be true. Either way, she’s nicely pictured in an alphabet frame. She’s just waiting to be your kid’s friend and help them find every q on this page. The letter recognition on this page may be tough. There’s all kinds of fonts used your kids might not be familiar with. Hopefully they can find them all. There’s 12 on the frame (three on each side) and two in the sentence. As an added bonus, your kids can look for the hidden sight word “am” in the bottom part of the frame. Please color the queen so she looks pretty!